Both the US and JPN manuals for game 3 contained a lot of landmark firsts. The first Japanese manual that actually looks like a game booklet, for one. And with 32 full color pages and a history section to grant an overall picture of the franchise, what a manual it is! The US Manual was no slouch either, also the first in its line to have 18 full color pages (and 4 black and white pages), plus other exclusive goodies to its own side. We’ll do the Japanese instructions first, followed by the American (just as before). This time the translation will follow after each image to make reading a little easier to enjoy. The US manual scans will look a little nicer this time, since after what happened to my Mega Man 2 manual as a kid, I was pretty careful to keep this one nice. 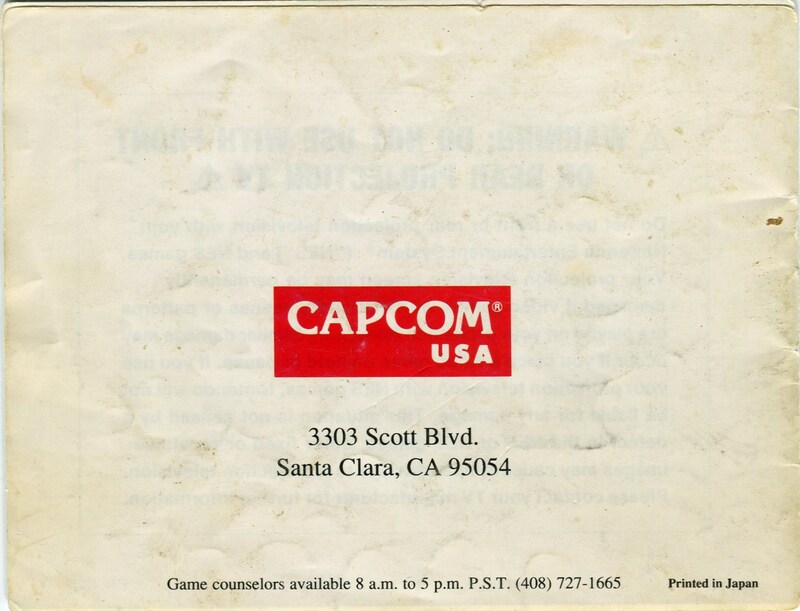 Thank you for purchasing this Capcom “Family Computer Cassette: ROCKMAN3 (CAP-XU)”. Please read this “Instruction Manual” carefully before operating to ensure correct handling and use of this product. Additionally, keep this “Instuction Manual” stored properly in a safe place. PEACE HAS COME TO THE WORLD. Dr. Wily has reformed, and he and Dr. Right have joined forces, working together to develop a giant peace-keeping robot named “GAMMA”. “GAMMA”…… It was the life-long dream of Dr. Right, a giant robot to protect and serve world peace. –However, each planet met with an unexpected incident. The robots who were mining the energy elements suddenly began going berserk!! Upon learning of this from Dr. 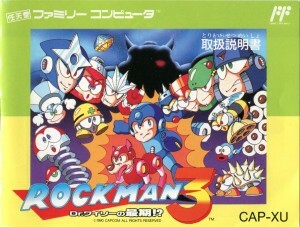 Right, “ROCKMAN” immediately set out on a path for the uncharted planets–a new battle was about to begin!! *Controller 2 is not used. When starting the game, the 8 boss characters of each stage are displayed on the screen. Begin playing any stage by moving the cursor over that character’s image and pressing the Start Button. After defeating the boss of each stage, you will obtain the weapon wielded by that boss. After defeating a boss and acquiring its weapon, pressing the Start Button during the game will enable switching weapons by opening the weapon display area. By moving the Directional Key Pad up down left and right, select the initials of the weapon you wish to use and press start to confirm your selection! Selecting NEXT will bring up weapon display area 2 on the screen. Rush has 3 useful forms which can be selected for use in the same manner as choosing a weapon. However, at the start of the game only the Rush Coil is available, while the other two forms can only be acquired by defeating certain bosses. Rush cannot appear on the screen more than once at a time. This ability is available from the start. Get atop Rush to perform a super jump. Enables swimming through the water, horizontally or vertically. On land, it is only able to jump. Soars freely through the air. Watch its energy usage carefully!! Rush Marine and Rush Jet can continue be used for as long as there is energy remaining. When you want to cut them off, just open the weapon select window and choose another weapon! 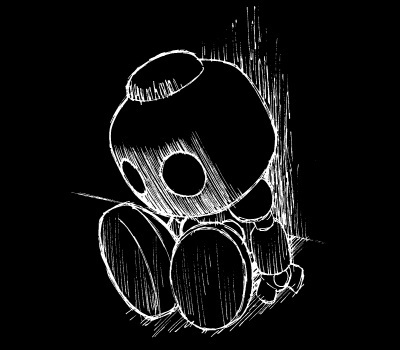 Cancelling Rush while moving over a danger zone or an area without footholds will cause the player to drop and fall. Please use caution. By holding the Directional Key Pad down and pressing the JUMP button, the player can perform a slide to get out of many tough situations!! By using this nimble burst of speed, you can slide underneath and slip past your enemies, and that’s not all!! There are some narrow passageways that can only be traversed by sliding!! Player count increases by 1 man. When this item is used, all life energy is fully recovered. Attack this, and it’ll transform into one of the other 6 previously mentioned items. In the year 200X, industrial use humanoid robots have been created thanks to the steady progress of science. These robots can work round the clock tirelessly 24 hours a day, at a superhuman rate. Then one day, some shocking news reached the world’s foremost designer of industrial robots, Dr. RIGHT. Humanity will be dominated by the robots!? Surely, this could only be the work of that evil genius, Dr. WILY. He must have modified the robots designed by Dr. Right to hijack their powers and make the whole world his plaything. “ROCK” was a household robot whom Dr. Right had always regarded as his own son. Now, in order to stop the 6 robots he had built with his very own hands and to recover each of their central cores, the Doctor has transformed Rock into the fighting robot “ROCKMAN”! Thanks to the efforts of the super robot “ROCKMAN” created by Dr. Right, the evil desires of that mysterious scientific mastermind Dr. Wily were stopped and peace has been restored to the world. Come time to input the password, use the A Button to select a chip color, then move the cursor to the proper location and press the A Button again to place each chip. The A Button can also be used to remove a chip that’s already been placed. No more Captain Commando messages for M3 Man. 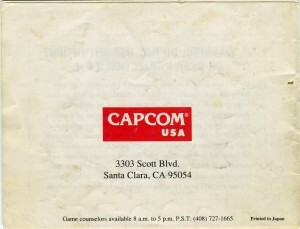 This time, it’s a thank-you letter from then-Capcom US VP Joe Morici, the man behind the “Mega” name. The Story pages of both versions is more similar than ever before, even featuring the same artwork. R3 Man tells the story via narration, while M3 Man explains it in the form of a voice communication between Dr. Light and Mega Man. It’s still technically possible to get confused which doctor is which, going from the manuals only. Dr. Right has been consistently changed to “Light” in the US manuals since the second one (so far), though they slipped up and used “Right” in the game itself, exposing the region to 3 different names for the good doctor (Wright, Light, Right). And just what is the deal with those mining worlds, the uncharted planets? The terms have never been too specific, I suppose they could be any planetary or celestial bodies, including moons, planetoids or asteroids (which is what Ariga went with for Rockman Gigamix). R3 Man and M3 Man share some pictures, but also have others that are exclusive to one another. The images of the items in M3 Man were original to that manual. R3 Man has a less than complete listing of stage enemies this time, but the full color images are still pretty nice. Like the manuals before, R3 Man contains screenshots, but M3 Man has none. Passwords aren’t new of course, but the grid layout and having red and blue chips are. M3 Man erroneously says to remove a marker by pressing B, but that will just take you back to the marker color select side. As was previously the tradition, R3 Man leaves the specifics of the special weapons up to the player to discover. This time M3 Man follows suit, despite that the M2 Man set precedent on giving data on the weapons. Continuing to cover what the other version fails at, R3 Man offers tips on how to use the new sliding mechanics, while M3 Man offers some good advice like shooting through walls and making the best of your post-damage invincibility, but explains nothing about the slide except for how to perform it on the controls page. Roll is mentioned for the first time in any instruction manual! In R3 Man, at least. “Mega Girl” would have to wait until the end credits for her name and nature to be revealed. M3 Man doesn’t mention Blues/Protoman/Breakman at all. R3 Man extends 2 pics and a short explanation of Blues that’s ripe with mystery. 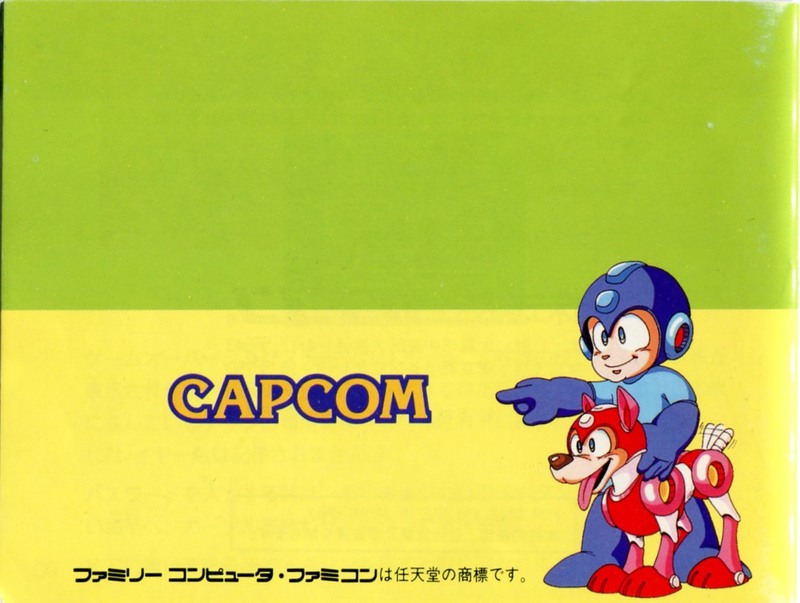 The first picture of Blues wouldn’t be seen in the US until the Mega Man 5 US Manual, while the second pic uses the Rockman 3 commercial’s helmet-free version of the character that wasn’t shown in the US until the Mega Man Official Complete Works book arrived on its shores. R3 Man sports an in-depth section explaining the stories and bosses of the previous 2 games. 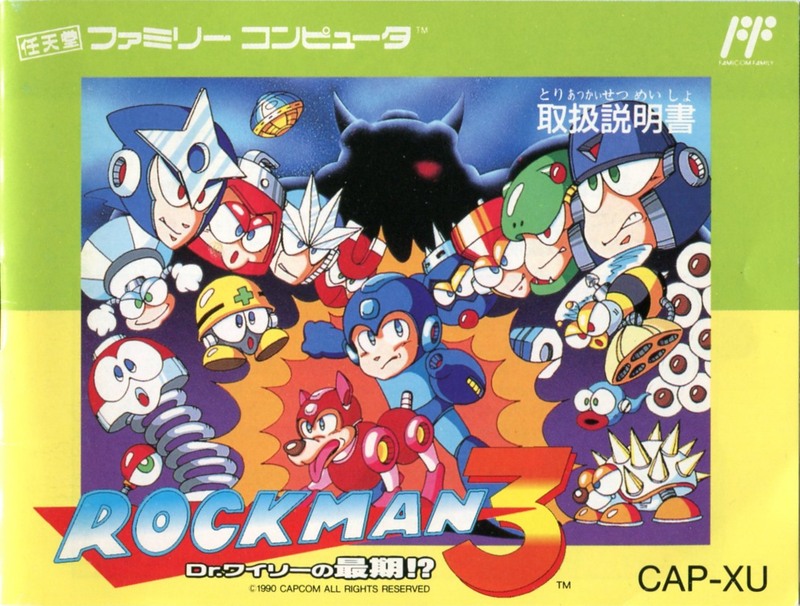 M3 Man instead contains the commemorative pic of all the 1 & 2 bosses with Rock, but gives no context for it. M3 Man has the typical FCC disclaimers and warranty warnings, plus 2 pages of black & white game ads and a blank page towards the end. R3 has some warnings too, but they tend to be more brief with less legalese. I really like both of these booklets. 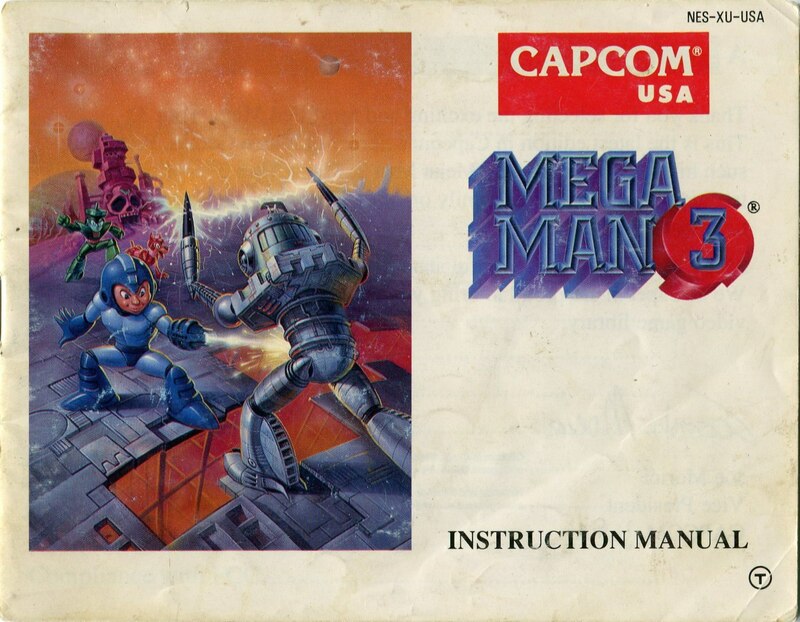 As a kid I was very impressed with the colorful pictures and descriptions of the MM3 manual, and I was similarly blown away the first time I laid eyes on the Japanese version so many years later. 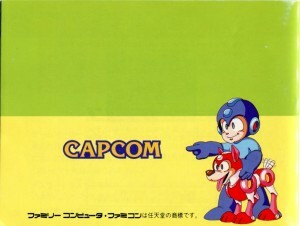 These two were truly the gold standard of Rockman manuals for their respective regions. 6 Comments to "Rock Manual The Third"
Heh, I forgot about the “obedience school” bit. And what’s with the shorthand “M3 Man” and “R3 Man”? Is “Man” short for “Manual”? Yeah, I thought it was topically appropriate. Oh yeah, I wanted to add something about how R3 Man called the weapon select screen the Cockpit, like Mega Man was a fighter jet or something. It makes a certain kind of sense, sure, but it’s just so strange. Great but it is in jpeg.. Can you make them into .png for higher quality ? I don’t really know much about file formats and all that noise, to be honest. If the file size is reasonable and the quality is better (and I wouldn’t necessarily count on it since my scans are mostly on the lousy side anyway), I wouldn’t mind using png for future stuff. I don’t intend to scan anything over, though.